Situate your import distribution centre at Delta iPort to optimize operating efficiencies and minimize transportation costs — potential savings can exceed CDN$ 10 million over a 10-year period. For import operations with significant volumes of container movement, the relative benefit of a particular location is impacted by the cost of dray services. To illustrate these dray factors, the following prototypical import deconsolidation facility is used. To better illustrate the cost differences and establish an equilibrium between rental rate and the increased dray service costs for a location in Campbell Heights relative to a location at iPort, the rental rate would have to be $3.72 to $5.96 less per square foot than the rental rate at iPort. Similarly, the effective rental rate in East Richmond would have to be between $0.88 and $1.10 less per square foot. 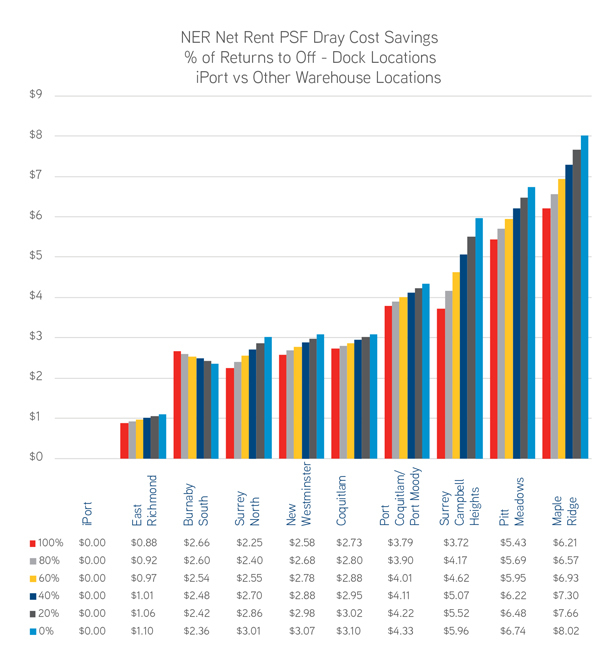 Due to the reduced cost of dray services to iPort compared to other locations, the present value of potential savings can exceed CDN$ 10 million when measured over a 10-year period. Regardless of whether import containers are returned to a Port of Vancouver facility or transported to an off-dock container yard, Delta iPort offers the lowest-cost alternative for dray services.